About Aurecon Aurecon brings ideas to life to design a better future. Imagining what is possible, we turn problems into solutions. For more information please visit www.aurecongroup.com C E L E B R AT I N G D I V E R S E T H I N K I N G The creative inspiration for the design of the awards brochure was the exploration of the connection between diverse thinking and award-winning innovation. The explosion of bright colours used in the design reflects the kaleidoscope of rich and colourful perspectives we bring to the work we do. 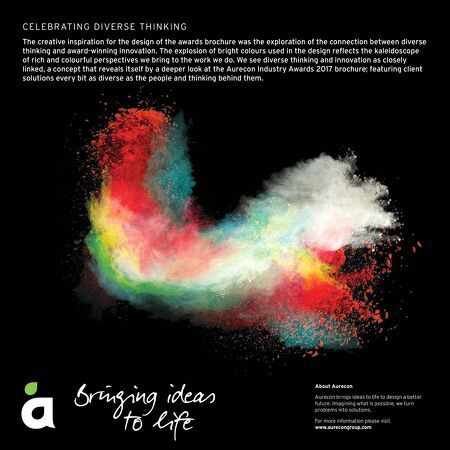 We see diverse thinking and innovation as closely linked, a concept that reveals itself by a deeper look at the Aurecon Industry Awards 2017 brochure; featuring client solutions every bit as diverse as the people and thinking behind them.